Very often, Africans are depicted on old pictures as naked people, walking around without any clothing. This seems to be quite at odd with the fact that the Dutch textile company VLISCO has been installed in Africa, more precisely in Togo, since 1846. So how could pictures from the 1800s and early 1900s only show naked Africans? The BBC recently ran a story on VLISCO and African textile tradition actually being European. The New York Times claimed that Africa’s fabric was entirely Dutch. I find this quite appalling, and I call this a falsification of history. For starters, before VLISCO, Africa had a very rich textile industry as noted by Kankan Moussa‘s entire delegation being clothed from cotton woven with golden threads in 1300s during his pilgrimage to the Mecca (this will be a story for another day), or the Kanembu clothing tradition which dates as far back as the 800s. It is misleading to believe that the Wax hollandais is the only fabric worn by Africans, when we know that the Bogolan rises from a long tradition of weavers in Mali, or the Kente cloth of Ghana. So what is the history of African fabric? 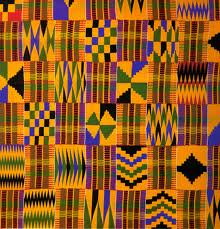 Is there an African history of textile? As pointed earlier, the African fabric industry is very old, and dates as far back as 5,000BC when ancient Egyptians began cultivating flax and weaving it into linen. An ancient pottery found at Badari shows an ancient depiction of a loom dating back to this period, while a 12th dynasty image from the tomb of Khnumhotep shows weavers using a horizontal loom (ca 2400 BC). Moreover, pyramids, sculptures, and hieroglyphs clearly show all Egyptians clothed. Even their neighbors to the south, the Nubians, had a flourishing textile industry, as can be seen on images on pyramids at Meroë, and images of the great queen Amanishakheto, as well as those of pharaoh Piye. Later on, as several civilizations flourished throughout Africa, cotton became a more commonly used fabric. The explorer Ibn Battuta does mention the presence of weavers in the Mali empire, and in Timbuktu, in the 1300s. As Islam was introduced in West Africa, many began wearing today’s version of the boubou. Today, one can find a full tradition of textile flourishing throughout Africa. The Bogolan or ‘mud cloth’ is hand-woven fabric hailing from Mali. Kente cloth, is Ghana’s national fabric, with the most expensive ones made with golden threads for kings only (in the olden days). It is said that the British explorers were amazed by the beauty of the Ashanti king’s attire. Cameroon has a long history of cloth made from the bark of trees, with some fabric particularly made from the obom. Fibers from the raffia are still commonly used to make bags, and clothing. Moreover, in West Cameroon, Kings are dressed with finely woven clothing made by the best weavers of the kingdom embellished with beads. The Pygmies use bark cloth made from tropical fig trees, while people from Chad and the Central African Republic weave cotton strips on horizontal looms; they use a variety of natural dyes. The Kuba people of the Democratic Republic of Congo, use raffia and make some of the most beautiful hand-woven blankets, clothing, and sculptures. The Ndebele of South Africa and Zimbabwe have a rich tradition of gorgeous colorful quilts and blankets entirely hand-made. Many would envy the elegance, color, and presentation of well-dressed Ndebele women. So why are the New York Times and the BBC trying to falsify history? Even VLISCO patterns are not Europeans, as they are inspired by Africans, and made to address the needs of the African population. Yes, Africans wear have worn VLISCO textiles and many Nana Benz have prospered from it, but that doesn’t mean that they do not have their own rich tradition of textile. Africans have their textile industry which dates back millennia, and has probably inspired many in the world. So today as you wear a wax hollandais, remember that there are Kente cloth, Bogolan, and many other beautiful garments made by local artists well-deserving of praise. I am leaving you with a documentary video on Kente cloth weaving. Enjoy! Hi! Thanks for this article and your blog. You share some very interesting information. I have a question: you mention the Kanembu clothing tradition that goes back 800 years. I’m very interested in the Kanembu, do you have any info on what clothes they wore traditionally? Like what did the Kanembu royalty and commoners wear in the time of Kanem-Bornu? Thanks Sean for your questions. I am currently reading about the Mai Idriss Alooma of the Kanem-Bornu empire. I will respond more amply in that article. African fabrics is very popular in our wold for his quality, color, design,stile and also looks very gorgeous .n thanks for open this blog .we can know about african fabricsn its history. Thanks for commenting and for visiting my blog Arif. 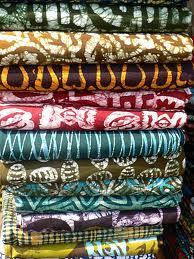 I totally agree… African fabrics is very beautiful, and offers great design, patterns, style, and chic. Thank you for reblogging this article. Now a days African fabrics is very popular all over the world .Every ages of people likes it very much for its color,design, amazing style, gorgeous look.thank you so much for your post. I am amazed of the correct knowledge which left a questioning deep dent on my mind-thinking. The lies and deceit which Western countries have portrayed Africa is still deep seeded in history books. Time to have this reviewed and re-written. I believe in philosophy rather and what is taught in the Westernized schools. Many thanks for making me conscious of this african craft. Dear Jean, I am so glad I could help. Yes… too many African contributions have been clouded or erased, and we (Africans) have been made to think that we never contributed even to our clothing! Thanks VsQ, I totally agree with you. Now you realize that so much of our history has been erased, re-written, etc… and it is our duty to reveal to all as it was truly. Thanks Kofi for the comment. Okay, this makes sense. Just like the African American …The history has been covered. Is there any way I can buy or purchase from the original master weavers in Africa? I would rather support them. How do I make contact from the United States? Or I can only do in person? I’m interested in different fabrics. However I do not know any one in Mali or Ghana. Thank you for this fascinating information. I am a university student in California (USA) and will be incorporating some of your facts (with appropriate citation of course!) in a report I am writing about Ghana’s textile and clothing industry, and the effect second-hand clothing imports are having on it. Thanks Shari; This is quite an honor. Do let me know if there are other ways I could help. All the best in writing your report! Thank you so much for informing us. I recently visited Uganda and came to know the markets were selling african inspired fabrics from China. I wasnt aware they were knock offs and now i am starting a store that sell authentic african fabrics made by the women in Uganda villages. It broke my heart to see them being robbed of their craft and source of income for their families. Thumbs up Shundra! I totally agree with you, and I thank you for this great endeavor which restores Ugandan/African craft and craftmakers to their rightful place. I am glad to find this article, because I was just now looking for information about patterns in African fabric designs: their history, symbolism, etc. There was an awesome exhibit on fabrics of Congo in New York, but they did not talk about the meaning imbued in the designs. Do you know any good books or online resources? Thanks again for this article! Thank you for commenting southsudanhoney. I will check it out and let you know more. 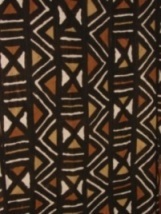 I do know that fabrics form Congo is very rich, like those of the Kuba people. Did you take any picture? Zimbabwean artist Safi Mafundikwa studied African symbols and writing; I am not sure if he does textiles. Thank you so much for your article! I am Dutch and travelled around several African countries and I am very interested in the history of the different textile prints and the meaning of them. The prints are so different in neighbor countries or regions. Do you know if there are workshops, lectures or courses about this? I cannot find any (in the Netherlands). Thanks for commenting Marjolein. I do not know if there are workshops… a while back, there were workshops and lectures in Mali. I will check again, and let you know if I find anything these days. It is a magnificent idea, and I think it should be done! Very thoughtful and well presented….. I run a similar blog called “Revised African History”. Do u mind if I share this article on my blog? Would love you to also read through my blog and pass ur comment, observation and commendations. Absolutely. Feel free to share on your blog. I will visit yours as well. Thank you Dr Y for digging out history on African textile. We have been made to believe that Africa is black and has nothing valuable to offer to the world. I bluntly disagree. So if you don’t mind can I be reblogging your articles. Absolutely Adedayo, you can definitely reblog the article. And thanks for liking it, and sharing with others. Dr Y, iam from Uganda and passionate about fashion in african fabrics where in the,world can I get the best hands on training to make such elegant fabrics so that there is change in uganda too interms of manufacturing textiles. Well, Kisy, it depends on the kind of fabric. To learn how to make Bogolan, the best places are in Mali. To learn how to make Faso dan Fani, Burkina Faso is the place. Very close to you in Congo (DRC), the Luba people make elegant fabric from raphia. To make Ndop, Cameroon would be the place. Lastly, to make Ndebele blankets, I am sure Zimbabwe or South Africa will be the best places. For Kente, Ghana is the best place. Now, I know that in Mali they do have some schools to learn to do these, and in Ghana, Kumasi is the best place for Kente cloth weaving. I guess you really need to know what you want to specialize into, and then choose. I am high school teacher and an avid crafter/seamstress. I sincerely want to make prom dresses for our students who have immigrated from Uganda. In the situation they would like a dress or gown made of traditional fabric, where can I find the most regionally accurate fabric designs? Dear Charrica, I am not sure at the moment. I will look and let you know, but for starters, look on etsy. Another place, depending of what city you are in (if you are in big metropolitan area), there are lots of African stores, and in those, they usually sell some fabrics. So look for those. I am a quilter and also sew clothing. What is the alternative to purchasing the European waxed cloth? Are you aware of any particular cloth that originated with the Mende people from what is present day Sierra Leone? Thank you in advance for your responses. Have enjoyed your articles so very much! Thank you. I am from European descent but was born in Africa oblivious of the rich history and mostly unfair history throughout Africa. I am learning lots about it and regret not having had all these teachings then. Thank you again. Thanks for commenting Ninita and for visiting the blog. They say it is never too late to learn, so now you can become more acquainted with Africa’s rich cultures, and being born there, you have another perspective that others would not have. I really liked this article it’s not only factual but it shatters the lie that Africans were ‘clothed’ by the Europeans. I hope to see more articles and research that is used to present the truth and wealth and heritage of different cultures. Thanks for commenting Val T, and for visiting the blog. I will keep writing others. how can I purchase material? Where are you living? There are several websites which offer a way to purchase material online: etsy, fabricsusainc, fabricwholesaledirect, moodfabrics, and some others. If you are in a big city, chances are that if you visit the local African market store, that you will find fabrics there directly, and you will also be able to chat directly with the seller. I am not quite sure about East Africa, as in West Africa… but it might have been at least earlier than the 16th century: in Ethiopia, there is a long cotton weaving tradition which goes back at least to the Solomonic era (Queen of Sheba) and Emperor Lalibela is 1162 AD; and in Sudan, Queen Amanishakheto is depicted on her stela fully dressed – so weaving dates as far back as 10BC – 1AD; and there was an Arab interaction out of Zanzibar. For Kenya, I couldn’t tell, but it is surrounded by these countries. To buy Kente cloth in Louisburg, NC, I do not know where you can go, but you can definitely check out on the website Etsy (I have seen some there), AfricaImports.com, FabricWholeSaleDirect.com, KenteCloth.net, and maybe Amazon as well. There are countless websites out there for these, so you can definitely check them out. I also wanted to add that if you are not too far from Raleigh NC, I am sure that there are local African stores there, and some of them tend to sell some Kente cloth. Why DO THEY KEEP…………. TRYING soooooooo HARD to INSTILL in the MINDS of other nations……..
That THEY TAUGHT ONE of the 1st NATIONS TO DAWN THE EARTH that they came along and taught THEM about ANYTHING?????????? Thanks for commenting Amir, and thank you for visiting the blog. Those African textiles look amazing. It was great learning about the different histories of them. Seriously, shame on the media for falsifying all of this information and perpetuating the naked African stereotype.